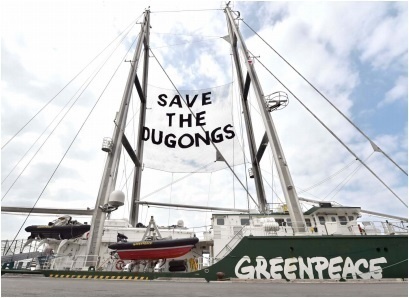 Greenpeace's Rainbow Warrior bears a banner reading: "SAVE THE DUGONGS" at Naha New Port on the afternoon of November 1. Together with local residents, the team on board the ship will launch a protest campaign, including conducting research in the ocean surrounding Henoko. The ship is scheduled to sail for Oura Bay off the coast of Henoko on the night of November 5. It is the fourth time the Rainbow Warrior has been dispatched to Okinawa. On October 13, Okinawa Governor Takeshi Onaga revoked his predecessor’ s approval of the landfill, which was widely disputed because the former governor’s decision broke a key election promise. The land minister overturned the incumbent governor’s withdrawal of the landfill permit and stopped the effect of the revocation. Further, the central government will use a subrogation clause under local autonomy law for works handled by local governments to advance their claim that the landfill is legal. On October 29, the Defense Ministry’s Okinawa Bureau restarted the work at Henoko. Greenpeace aims to raise international public awareness of the reality in Henoko, where the Japanese government is advancing the construction of the U.S. airfield against the will of citizens.